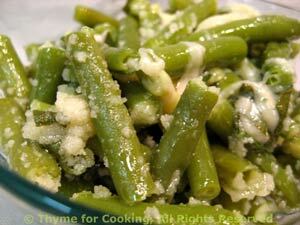 Green Beans with Parmesan, healthy, seasonal eating, Thyme for Cooking. A simple treatment letting the full flavor of the green beans shine through. Use either regular green beans or the flat Italian Romano beans. Put in small skillet with stock, put on medium heat and bring to a boil. Turn heat to low, cover and simmer until done - about 10 minutes. Melt butter in the same pan. Return beans to pan and toss to coat with butter. Put back into serving bowl, sprinkle with Parmesan, stir gently and serve.